This winter escape to warm weather and good times. Enjoy the La Ventana Classic, a raucous, adventurous and unique windsport/paddle sport event. Set for January 16-20, 2019 in Baja Sur, Mexico, at a stunning event site situated between the azure Sea of Cortez and rustic foothills of the Sierra de la Laguna mountain range. Paddleboarders compete in a variety of spectacular “DOWNWIND” races during the La Ventana Classic!!! Each day brings an adventurous downwind paddle and excellent chance to race with the wind at your back. Run with the group on the amazing and most scenic Las Cruces Downwinder (8 Miles), cross the Sea of Cortez from Jacque Cousteau Island (Cerralvo Island Crossing – 11 miles) and enjoy several mini-downwinder courses that are set along the beautifulBaja Sur coast. 12’6″ and 14′ board categories available for men & women in both Competitor and Sportsman classes. In addition to the many fun events, there will be awesome beach parties, rocking bands, authentic Mexican food vendors, colorful dance presentations by local schools, and the most excellent awards party. The event will be MC’d by the infamous kiteboarder icon Neil Hutchinson of X-Rated Kiteboarding and Grom Gormley the icon of West Coast Kiteboarding events. 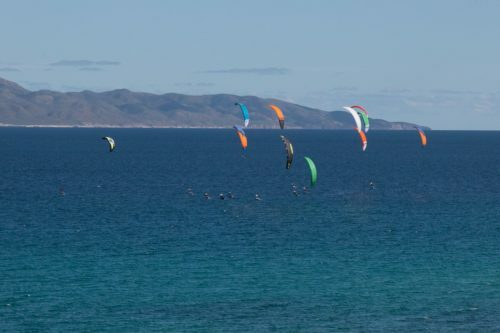 The 10th annual La Ventana Classic is organized by Tim Hatler of Palapas Ventana resort and Marina Chang of The Kiteboarder Magazine. The event takes place in La Ventana, Baja Mexico – 35 minutes from the La Paz Airport and 2.5 hours from the Cabo Airport.